WinADay Casino already had a great collection of penny slots -- games you can play for just a few cents a spin -- alongside their many premium real money online slots. 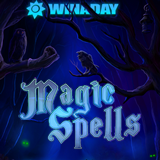 Today they added another new one with a sorcery theme called Magic Spells. It’s a 5X4 slot with Expanded Wilds and a Pick Me bonus game that awards instant prizes. The fourth row gives more possibilities for winning combinations than a regular three-row slot game has. WinADay is giving a $10 Freebie and up to 60% deposit bonuses beginning today and continuing through the weekend.. There are potions, magic wands, witch’s hats and spell books on the reels of this mystical new game. It's a penny slot so players can bet as little as $.20 or a max bet of $5. Mystical sorcery-themed penny slot has Pick Me bonus game and Expanded Wild. Magic Spells’ Wild symbol is a bubbling cauldron. It’s an Expanded Wild that can cover up to four positions resulting in multiple winning combinations. “Between the Expanded Wild and the fourth reel I won’t be surprised if this game turns out to be pretty loose,” speculated WinADay casino manager Michael Hilary. WinADay Casino now offers 19 unique penny slots and 34 premium slots. There's also Keno, Roulette and four new video poker games introduced last fall bringing the total to 67 real money online casino games at the unique online casino. You can play most of these games on your smartphone or tablet as well as your desktop or laptop computer.